Along with rejecting our proposals for longer term contracts, language around promotions, guarantees of significant timelines for reappointment, seniority, and basic requests for union stability like wifi access, they offered literally nothing for salary increases for adjunct instructors. Zip. Zero. By proposing the current salary minimum of $1,300 per credit hour as their economic offer for the 2018 academic year, they’ve proposed that hundreds of adjunct instructors receive no raises for the life of our contract. Their team also didn’t respond to the final 11 articles in our proposed adjunct instructor contract. To our negotiating team, this hardly signifies a good faith effort to negotiate a fair agreement. We were at the negotiating table again yesterday, the first time since August 22nd. We argued with the administration over issues of longer term contracts, the need for stable and continuous employment for adjunct instructors, and the real need for significant amounts of advance notice about teaching classes. We also formally requested a clear answer as to the minimum enrollment numbers before a class is cancelled. floor of Fenster Hall. Adjunct Instructors deserve a fair contract that recognizes our professional contributions to NJIT! We will be back at the table on the afternoon of Tuesday, September 26th. We expect a full counter-proposal by that time, and look forward to receiving a serious economic offer, given the university’s strong financial position, as recently reported by the NJIT Chief Financial Officer at a recent Faculty Senate meeting. But we need your help. We want to show the administration that adjunct instructors are a valuable part of the NJIT community, and that we expect a fair contract that recognizes our contributions to be bargained on time and in good faith. Will you join us on Tuesday, September 26th at 2:00pm on the 5th floor of Fenster Hall to stand with your colleagues? Please RSVP so we can bring union t-shirts for everyone! Our negotiating team was back at the table on Tuesday the 22nd to bargain with the administration for both adjunct instructors as well as graduate and research employees. You can find the UCAN graduate employee proposal here and the adjunct proposal here. Their team responded to our proposals by only sending us counter-proposals for a graduate and research employee contract (found here). We’re still waiting to receive their counter-proposals for an adjunct contract. Both our original proposals and their counters are posted on the website. Take a look, and if you have any questions, don’t hesitate to reach out to talk with a bargaining team member for clarification. We sparred with the administration’s team over the issue of wages, parking fees, dates for reappointment, union representation, paid orientations for graduate and research employees, an effective grievance procedure, as well as workload. The administration’s team is insisting on raising the minimum graduate employee salary to $22,000 per year, despite the fact that most graduate employees already earn more or a comparable amount, effectively putting forward a 0% increase for most graduate employees. We pushed for equity with graduate employees at Rutgers University, which means we want a 15 hour workweek rather than the current 20, equal pay for equal work, better healthcare, and cheaper parking. The administration insists that graduate employees are students first, and should be treated as students rather than as workers. We insist that as legally recognized public employees in the state of New Jersey, graduate employees deserve the same treatment as any other employee in higher education. We also pushed for the elimination of a probationary period for research employees, to guarantee the payout of unused vacation time, as well as wage increases. The administration’s team also told us in no uncertain terms that their standing orders are to settle our two contracts rather than delaying, so we look forward to meaningful good faith negotiations. We’ll be back at the table next week. We’ve proposed six more bargaining dates for the month of September, and we’re eagerly awaiting their counter-proposals for an adjunct contract, which we expect next week. If you have any questions or would like any clarifications, don’t hesitate to reach out! Finally, we are looking to set up department meetings to update everyone on the contract negotiations and discuss next steps. Please email Jacob Chaffin at jchaffin@rutgersaaup.org if you are interested in having a union representative talk to your department. Our team was back at the negotiating table with the administration Tuesday, July 25th, and we’re happy to report on our second bargaining session. Using the information we’ve collected over the last academic year through hundreds of in-person interviews, and supplemented with all of your responses to our recent bargaining surveys, we put forward a batch of creative proposals that would dramatically improve the lives and working conditions for the nearly 800 academic workers that will be covered under any future contracts. We also formally requested information from the administration around issues of graduate employee summer funding, health insurance plans for all covered employees, and mandatory fees in order to have accurate data with which to craft specific improvements which we will also submit soon. The administration spent the session listening to our proposals, and informed us that they would give us a complete response at our next session, as well as some proposals of their own. We agreed on multiple bargaining dates in late August to give them time to prepare, and are ready to work hard to reach a fair settlement soon. It’s our pleasure to report to you on our first bargaining session with the administration of NJIT, which took place on Tuesday afternoon, June 27th. Given that this was our first meeting between our union’s bargaining team and representatives from the administration, it was a short session focused mainly around introductions and outlining our goals in broad strokes. We told the administration that we anticipate bargaining in good faith and working to achieve just and equitable contracts improving the wages and working conditions for all graduate employees, adjuncts, and post-doctoral researchers in every academic unit at NJIT. We told them we are eager to get to work negotiating, and that we intend to spend the summer putting forward concrete proposals for their consideration. The administration’s team responded to us, and though we can anticipate areas of disagreement, their lead negotiator assured us of treating our union’s bargaining team and the entire workforce with respect and dignity. We plan to hold them to their promise. We committed to working straightaway to get into meaningful negotiations with them and commit our proposals to paper for them to review. During our recent unionization campaign, adjunct, post-doc and graduate employee members of our Organizing Committee met with and interviewed hundreds of people all across NJIT from different backgrounds. We heard loud and clear the serious issues we need to improve upon at NJIT. On February 22nd, United Council of Academics at NJIT (UCAN) held an election to ratify a constitution, which included an affiliation and alliance with the Rutgers Council of AAUP Chapters, and to elect interim-Officers. This election represented a major step forward for UCAN in pursuit of building a strong labor organization for academic workers on campus. In accordance with the constitution, UCAN must hold another election for the coming year. You must be a member of UCAN to participate and vote in the upcoming election. President– serves on the Executive Board and committees, represents UCAN in all official capacities, and is responsible for annual reports the membership. Vice President– serves in the absence of the president, maintains official non-financial records of the organization, oversees the Elections Committee. Secretary– Treasurer- oversee and maintain all financial and membership records. All information pertaining to the duties of the Executive Committee can be found in Article VI and V of the UCAN Constitution. To request a copy of the constitution, please respond to this email and a copy will be delivered to you. From the Floor— Nominations may be made from the floor of the April 10th General Membership Meeting, with candidates approved by vote of the membership meeting. By Petition–To be nominated a candidate must submit to the Elections Committee a petition containing the signatures of twenty (20) signed up union members. Petitions must be submitted by the April 10th General Membership Meeting. Any signed-up union member is eligible to hold office. Members nominated to run for office must affirmatively accept their nomination, and the terms for all positions are 1 year. Elections for UCAN officers will be held by secret ballot on April 26th and 27th. The majority of the ballots cast shall determine the outcome of the election. Results of the election will be published and notifications will be sent to members after fifteen (15) days of the election. Only members of UCAN will be allowed to vote in the election. The mission of UCAN is to create an active membership that sets the priorities and activities of the union for continued organizing and advocacy. I have attached a membership form to this email. In order to vote you must fill out and return the membership form. In order to lay the foundation for a permanent and strong union organization, members will be voting to adopt a draft constitution, elect officers, and decide upon affiliations with local, state, and national organizations. Members of UCAN will be able to vote to ratify the constitution and elect officers on Wednesday, February 22nd. We will be holding a vote by secret ballot in the Robeson Center— Hudson Rm 255 (Rutgers campus, 350 Martin Luther King Jr Blvd ) from 12:00 PM to 6:00 PM. You can stop by at any time during those hours to review the constitution, ask questions, join the union and vote. In order to vote, you must first become a member of the union by filling out a membership card. Please contact Jacob Chaffin with any questions. What is United Council of Academics at NJIT (UCAN)? All Graduate Student Assistants, Graduate Student Teaching Assistants, Graduate Student Research Assistants, Postdoctoral Research Associates, Research Associates, Research Architects/Engineers/Scientists, and University-paid (non-grant funded) full time Teaching Fellows are members of the United Academics at NJIT (UCAN-NJIT) union bargaining unit. What is in the contract? A collective bargaining contract defines the pay you receive including raises. Members have already benefited from pay increases we bargained. Equally importantly, when we started negotiating NJIT did not offer full health benefits for graduate workers at NJIT. The contract protects tuition remission, and offers a legally binding grievance process for solving problems. Set up an informal department meeting to host an AFT representative to give a 15-minute overview of the contract and take questions about the contract and membership. Contact us to set up a departmental meeting. Now is the time to join the United Council of Academics at NJIT. You can complete the membership application online. You need to be a member to vote on the contract and constitution. Shouldn’t you have a voice? The strength of UCAN is in the membership. Membership is voluntary. Members benefit by full participation in the union with voting privileges on important union issues including contract ratification, elections of officers and participation in meetings and committees that directly affect your working conditions. Membership is the right thing to do. Join today by following the instructions above or contacting us to discuss membership. Jerry McCrea/The Star-LedgerAli Avni Cirik, of Turkey, is an NJIT graduate student helping organize one of the first labor unions for student workers in the state. New Jersey Institute of Technology graduate students and research workers recently petitioned the state to form their own union to fight for better pay and benefits for students who teach and work on campus. TRENTON — Frustrated by low pay and limited health benefits, graduate students and researchers at the New Jersey Institute of Technology have petitioned the state to form their own labor union. If the request is approved, the public university will have to negotiate a contract with the nearly 430 student teaching assistants and postdoctoral researchers who will make up the new union on the Newark campus. The workers — who are paid an average of less than $18,000 a year — say they want higher salaries, better health care and improved working conditions for graduate students who teach classes and assist with research projects. “I honestly think we can change the environment at NJIT,” said Ali Avni Cirik, 27, one of the doctoral students who helped organize the union movement on campus. Union officials said the new unit — called the United Council of Academics at NJIT — would be the second of its kind in the state. Rutgers University teaching assistants and graduate students unionized in 1972, helping spark similar campus movements around the country as budget-conscious universities turned to inexpensive graduate student labor to teach more classes. NJIT students said they were inspired to organize after seeing their counterparts on the neighboring Rutgers-Newark campus were earning better pay and benefits for the same teaching and research work. “We said, why don’t we do this? 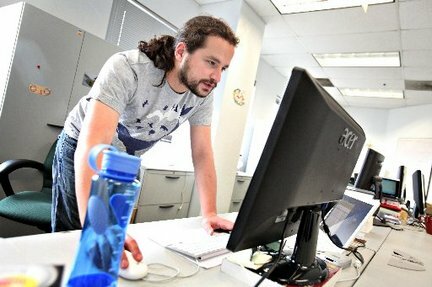 Why don’t we form a union?” said Cirik, a native of Turkey working as a teaching assistant in NJIT’s information systems department. The average salary for a Rutgers teaching assistant or graduate assistant is about $23,100 for a 10-month appointment or $26,350 for a 12-month appointment, union officials said. By comparison, the average NJIT teaching assistant earns less than $18,000 for a 10-month appointment. Most students teach or do research part-time while working on their own master’s or Ph.D. degrees. NJIT students submitted their union petition to the state Public Employment Relations Commission in Trenton earlier this month. The paperwork includes cards signed by more than half the 430 workers who would be included in the new union, PERC officials said. The commission will spend the next several weeks researching whether the students meet the requirements to unionize. The new unit would be affiliated with the American Federation of Teachers, a union that represents professors and other workers at more than a dozen New Jersey colleges. NJIT officials declined to comment on the students’ efforts to organize. If the union is approved, NJIT will have to open contract negotiations with the teaching assistants and researchers in the midst of statewide budget cuts. Shilan Motamedvaziri, a graduate student from Iran, said she spent weeks telling fellow teaching assistants about the union and encouraging them to sign the cards for the petition. Though many of NJIT’s graduate students are from outside the U.S., and some were unfamiliar with the concept of an American union, they quickly embraced the idea. Motamedvaziri said she earns about $18,000 a year working 20 hours a week as a teaching assistant in a chemical dynamics course. If the union is approved, she said, students will have to decide what issues to fight for in labor negotiations. “The next step for us is to find out what the students mostly want,” said Motamedvaziri, 30, of Lyndhurst. The PSA/AAUP is the largest union at NJIT representing more than 700 faculty, professional staff, and university lecturers. You may not know it, but you likely work with our members on a daily basis. Our members include Associate Deans, Department Chairpersons, full-time instructors, faculty program directors, department administrators, and other professional staff from departments like financial aid and academic computing. The PSA has been in existence since the early 1970’s and remains a strong and effective unit. The PSA negotiates the terms and conditions of employment for its members with the administration. The PSA/AAUP has been successful at negotiating competitive pay and benefits for our members. Most recently, the PSA successfully negotiated an agreement, covering the period through June 30, 2011, that includes pay increases, and improves job security for many of our members. The PSA/AAUP serves as an advocate and voice for its members. The collective agreement allows for basic workplace expectations and entitles its members to due process. The PSA works hard to achieve the best results for its members and ultimately for the good of the university. Because the PSA/AAUP and its members have experienced first-hand the benefits of collective bargaining, we would support an NJIT group seeking representation and the entitlements of a voice in the workplace. Together, we all can make a positive difference. The PSA/AAUP. Approved: April 1, 2010.